Are Broncos QB Peyton Manning's frequent mistakes more mental than physical? Doug Farrar breaks down the myth. In our "MythBusters" series, SI.com’s Doug Farrar uses tape, statistics and conversations with some of the NFL’s most knowledgeable voices to debunk ideas surrounding the league's top storylines that have gained traction. In this installment, Farrar debunks the notion that Peyton Manning is still making the on-field decisions that have made him one of the NFL's greatest quarterbacks. MYTH: Peyton Manning's body is breaking down, and it's his football mind that's keeping him in the NFL. REALITY: Right now, Manning is making throws—and decisions—we wouldn't expect of any great veteran quarterback. By any standard you'd choose to use, Peyton Manning is one of the worst starting quarterbacks in the NFL right now. There are no qualifying statements around that—it's not like 2014, when the future Hall-of-Famer would alternate iffy play with stretches in which he'd look like the Manning we're used to. This season, there are a few plays of pure goodness, surrounded by a bunch of sloppy stuff. As a result, Manning's numbers have plummeted this season—all of them, all the time. He's completed 146 of 237 passes for 1,524 yards, seven touchdowns and a league-leading 10 interceptions. His 61.6 completion rate is the lowest since his rookie year of 1998; his 3.0% touchdown rate is by far the lowest of his career and nearly half of his 5.8% career average; his 6.4 yards per attempt average is the lowest of his career and a full yard and a half lower than last year's 7.9 (his career average is 7.7); and his 4.2% interception rate is the highest he's put up since 2001. No matter the rating system, Manning isn't among the top 32. He currently ranks 33rd in Football Outsiders' opponent-adjusted DVOA and DYAR metrics, which is dead last among qualifying quarterbacks. He's never ranked lower than eighth in either category since his rookie season. He's completed 26.6% of his deep passes this season (six of 26 attempts, per Pro Football Focus), which is a lower deep completion rate than Sam Bradford's. We can parse this 100 different ways, but one thing is clear: There's no resemblance to the great player we've seen for so very long. Why the swift decline? Last week, I investigated the possible misfit between what Manning does best and what Kubiak wants out of his offense, but this goes beyond that. And it was assumed that when he came back for an 18th season, his renowned game intelligence would show through, offsetting his own limitations and any growing pains brought about by a system run by hew head coach Gary Kubiak. That obviously hasn't happened, and as much as people are wont to blame Kubiak as the rogue factor, a hard look at Manning's interceptions and other errant attempts this season paints a very different picture. For whatever reason, he's not seeing the field and reading defenses as before, and he's being fooled by simple stuff on a consistent basis for the first time in years. It certainly is, and the first step to improvement is to diagnose what's going wrong. We'll start with two of his three picks against the Browns, and the strange decisions involved. 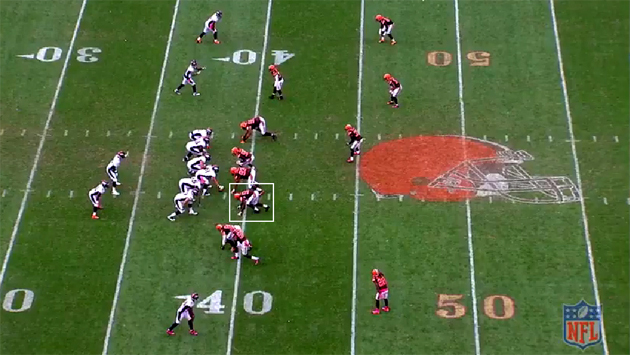 Manning's first pick against the Browns came at the end of Denver's first drive, with 12:12 left in the first quarter. 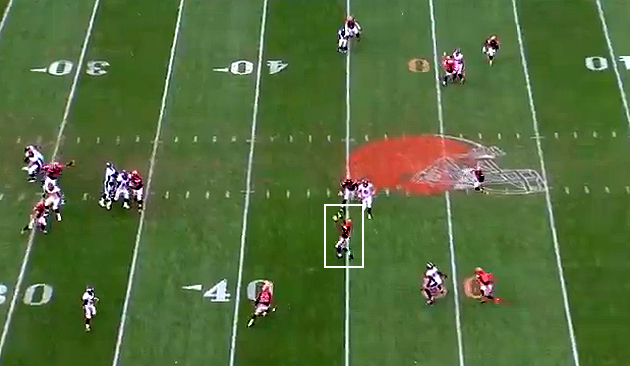 Linebacker Karlos Dansby, one of the better pass defenders at his position, did a briliant job of faking a blitz at the snap and then dropping into straight coverage to take the ball away. The distressing thing here is that by the time Manning had turned his back to run play-action out of the pistol, with the goal of hitting Emmanuel Sanders on a crossing route, Dansby was already dropping back into that spot, and cornerback Tramon Williams trailed Sanders inside to provide double coverage. Perhaps Manning thought he'd have an opening on the playside because of the safety blitz look, but the throw was late and with sub-optimal velocity. This play had no chance. Manning's third interception of the day, by linebacker Barkevious Mingo with 14:34 left in overtime, is another example of a simple disguise presenting uncharacteristic issues for our hero. 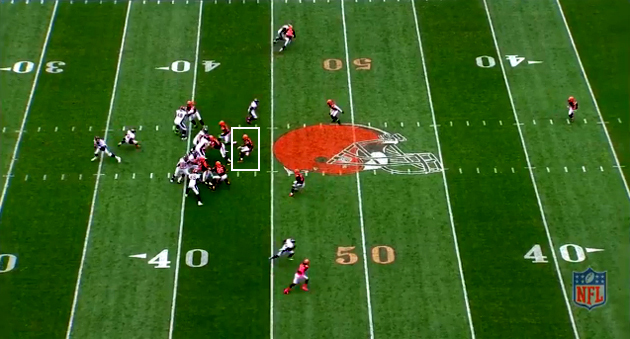 The Browns presented a wide overload blitz look to Manning's front side with linebackers Paul Kruger and Christian Kirksey, but Kirksey dropped back into coverage at the same rate as Mingo, who did so from inside the formation. Manning should have picked up on Mingo's drop, because Mingo went from a three-point to a two-point stance before the snap. 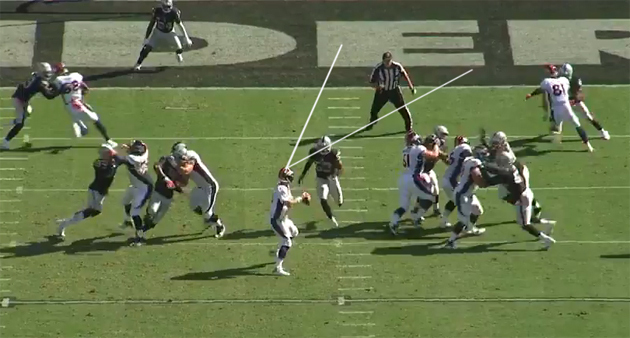 Demaryius Thomas ran a simple curl route to that side, and there was no obvious way to get him the ball. 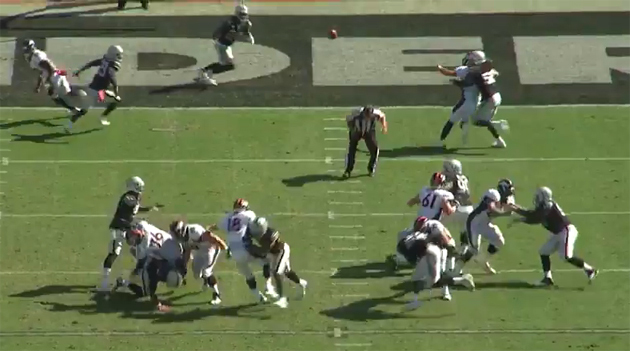 Manning didn't look to his backside at all, and there was time after Kruger's stumble on the pass rush, but he made the throw he should absolutely not have made. The first of Manning's two picks thrown to Oakland safety Charles Woodson in Week 5 (the first time one 39-year-old NFL player had ever intercepted another, for you trivia fans out there) doesn't look good from any angle. Here, we have the overhead and the end zone to show you the flawed structure and execution of the play. Manning is trying to make a quick throw to TE Owen Daniels for a touchdown, but he's also got an easy open read to receiver Jordan Norwood out of a bunch formation to the left side, and he doesn't look there at all. Instead, and in part to counter a blitz from linebacker Malcolm Smith, he makes the quick throw to Daniels, despite the fact that linebacker Neiron Ball is trailing (some would say mugging) Daniels through the back half of his route. When Manning throws the ball, he's doing so to a slowed-up tight end, with Woodson obviously closing on the throw, and the need to throw the ball over the back judge. Again, how is this play going to succeed? Finally, there's this interception to Vikings linebacker Anthony Barr with 0:32 left in the first half of Denver's 23–20 Week 4 win. This is read you'd expect any high-quality collegiate quarterback to make. The pass is intended for receiver Andre Caldwell on a simple two-on-two game. 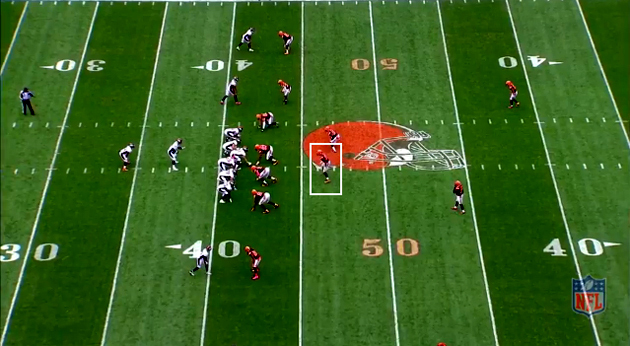 Barr takes the underneath receiver, and cornerback Terence Newman takes the high guy. Pretty easy, right? For the Vikings, yes. 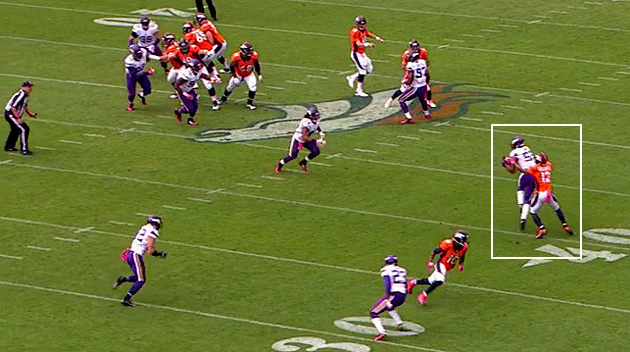 Manning throws with enough time for Barr to jump the route, and that's that. Is Manning also hindered by Kubiak's reductive route concepts? Unquestionably, but he's also missing wide-open receivers he didn't before. Is his timing thrown off by a patchwork offensive line? You bet, but he's also making thoughtless throws with clean pockets. 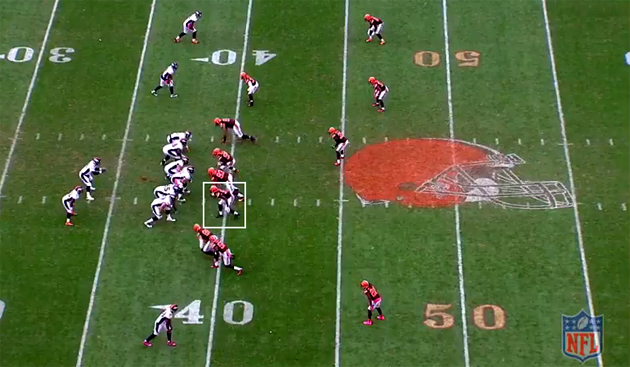 And would it help if Denver's running game could get any traction? Sure. But what we have at the epicenter of this dysfunctional offense is a quarterback whose season is collapsing in on him. Talk of benching Manning is generally regarded as heresy, but you can bet there would be a lot more of it were Denver's top defense not leading this team to its current 6–0 mark. With a bye this week, Manning and Kubiak can gameplan all they want, but getting to the root of Manning's astonishingly (for him) poor decision-making should be top priority.